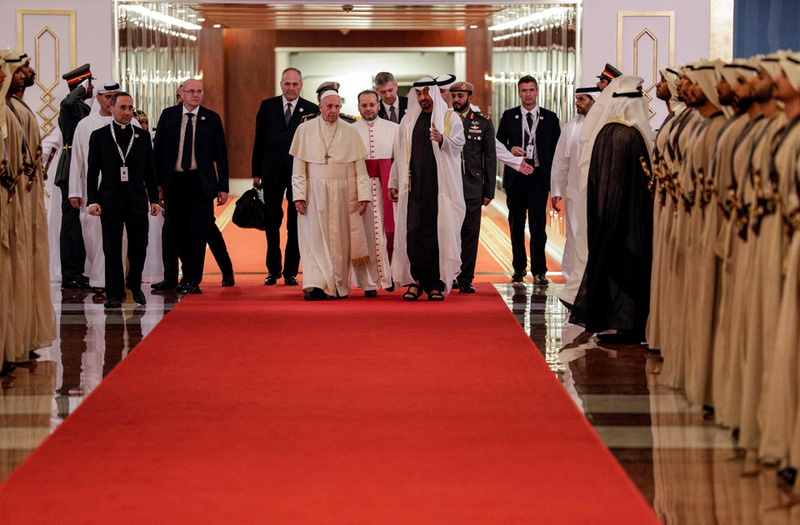 Pope Francis (L) is welcomed by Dubai ruler Sheikh Mohammed bin Rashid Al-Maktoum (R) along Abu Dhabi's Crown Prince Mohammed bin Zayed al-Nahyan (2nd-R) upon his arrival to the presidential palace in the UAE capital Abu Dhabi on February 4, 2019. 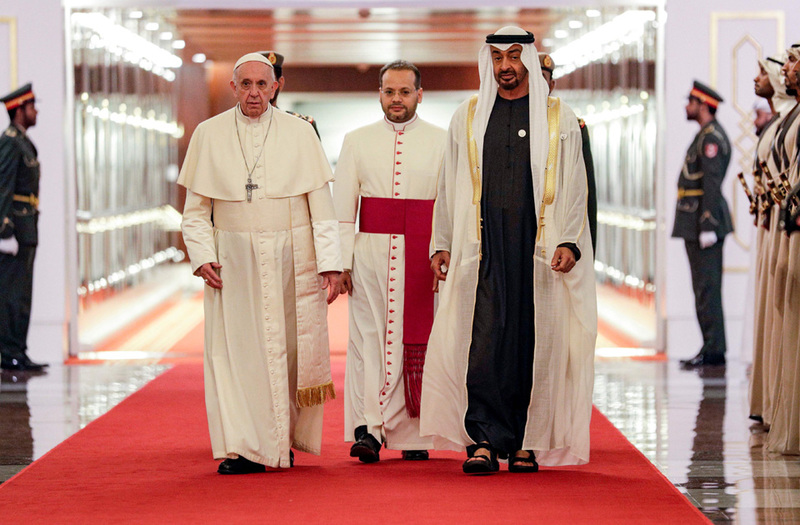 Pope Francis stands next to Vice-President of the United Arab Emirates and ruler of Dubai Sheikh Mohammed bin Rashid al-Maktoum, and Abu Dhabi's Crown Prince Mohammed bin Zayed Al-Nahyan during a welcome ceremony at the Presidential Palace in Abu Dhabi, United Arab Emirates, February 4, 2019. 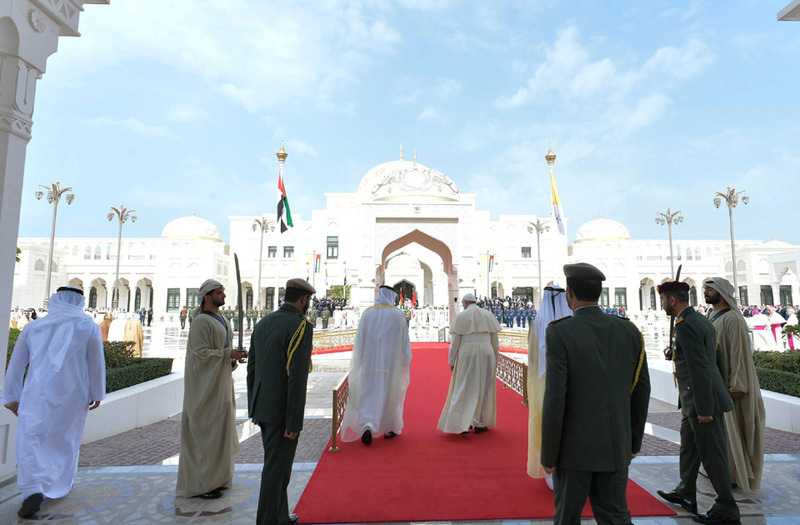 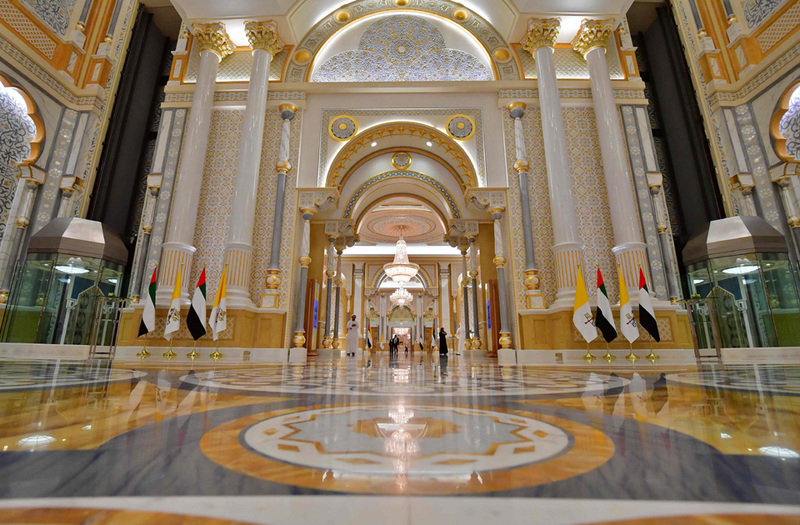 A picture taken on February 4, 2019 shows a view of the presidential palace in the UAE capital Abu Dhabi during a reception for Pope Francis, on February 4, 2019. 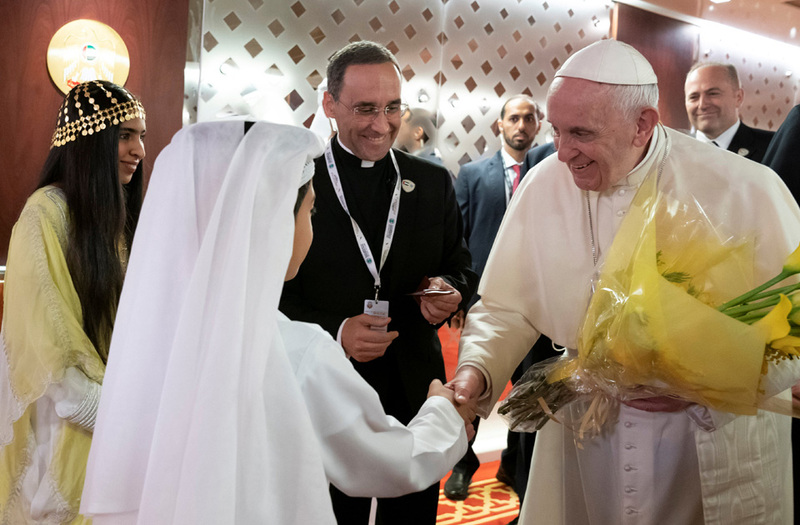 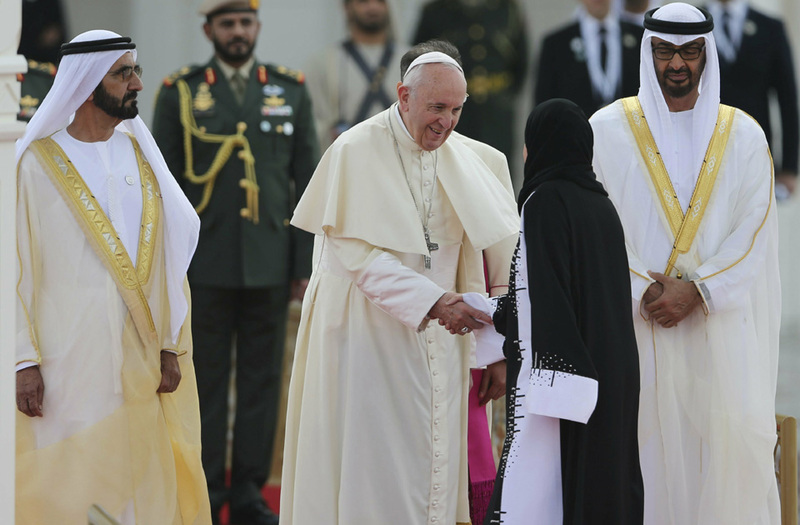 Pope Francis is welcomed by Abu Dhabi's Crown Prince Mohammed bin Zayed Al-Nahyan in Abu Dhabi, United Arab Emirates, February 3, 2019. 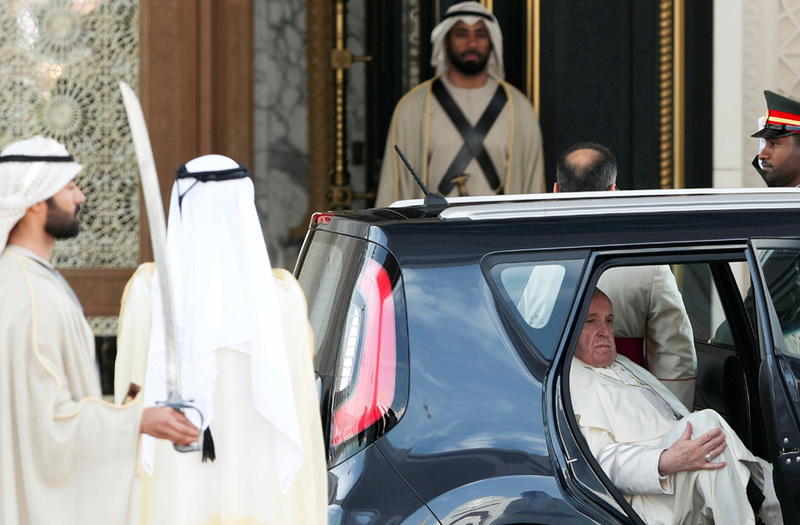 Pope Francis is seen upon arrvial to a welcome ceremony at the Presidential Palace in Abu Dhabi, United Arab Emirates February 4, 2019. 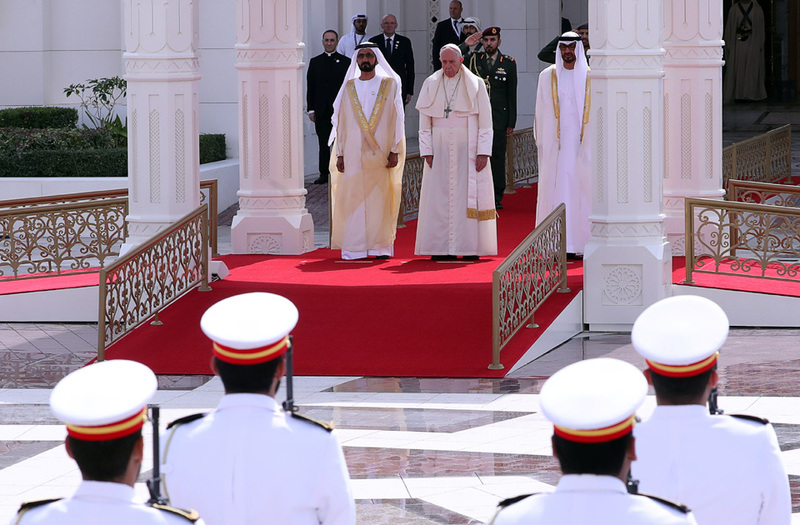 Pope Francis attends a welcome ceremony at the Presidential Palace in Abu Dhabi, United Arab Emirates February 4, 2019. 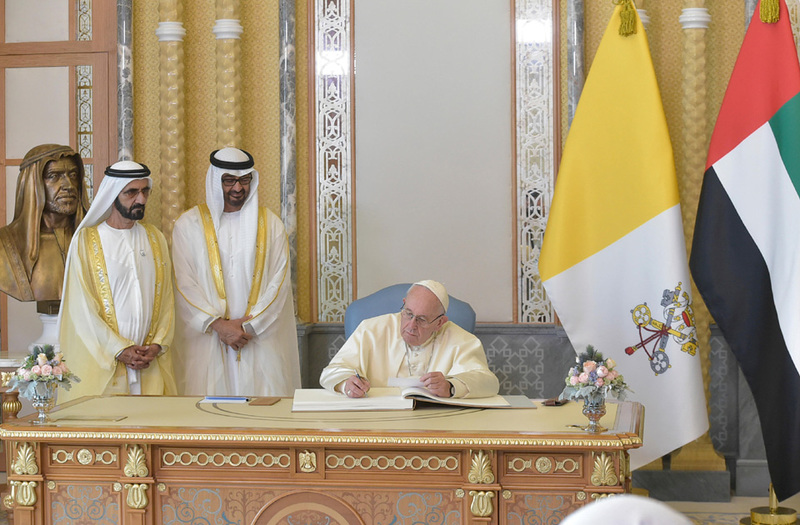 Pope Francis shakes hands with Amal Al Qubaisi, the President of the UAE Federal National Council, in the presence of the Abu Dhabi's Crown Prince Sheikh Mohammed bin Zayed Al Nahyan, right, and Sheikh Mohammed bin Rashid Al Maktoum, Vice President and Prime Minister of the UAE and Ruler of Dubai, at the Abu Dhabi Presidential Palace, United Arab Emirates, Monday, Feb. 4, 2019. 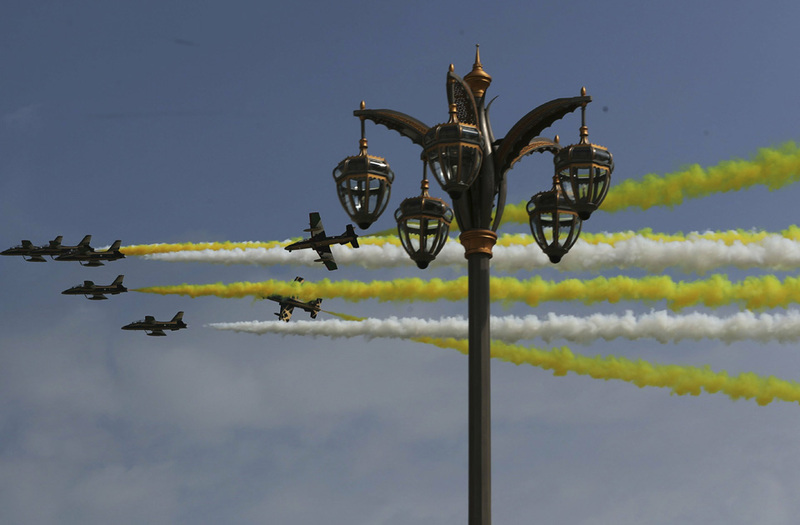 Al Fursan, or the Knights, a UAE Air Force aerobatic display team, perform as they make the colors of the Vatican flag ahead of Pope Francis arrival at the Abu Dhabi Presidential Palace, United Arab Emirates, Monday, Feb. 4, 2019. 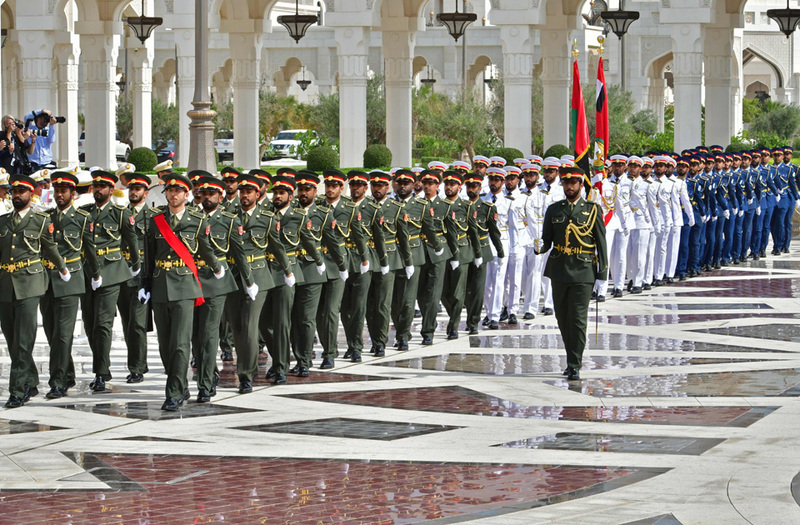 A military honour guard wait for the Pope arrival at the presidential palace in the UAE capital Abu Dhabi on February 4, 2019. 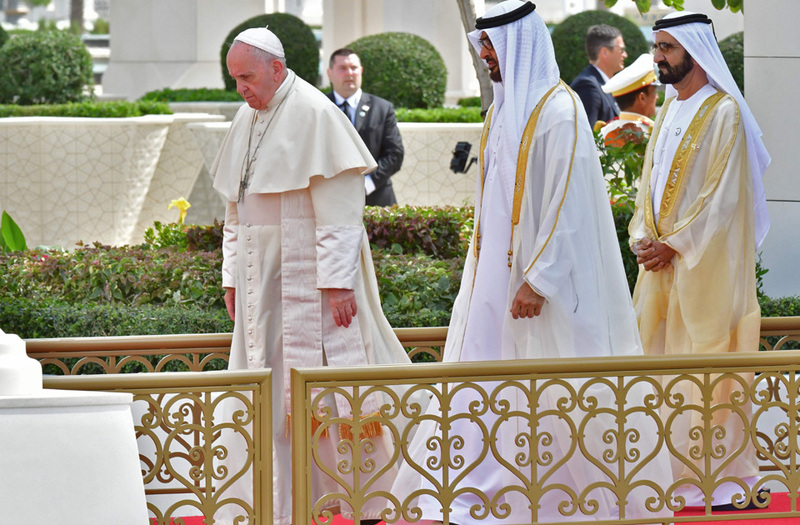 Pope Francis meets Vice-President of the United Arab Emirates and ruler of Dubai Sheikh Mohammed bin Rashid al-Maktoum, and Abu Dhabi's Crown Prince Mohammed bin Zayed Al-Nahyan during a welcome ceremony at the Presidential Palace in Abu Dhabi, United Arab Emirates, February 4, 2019. 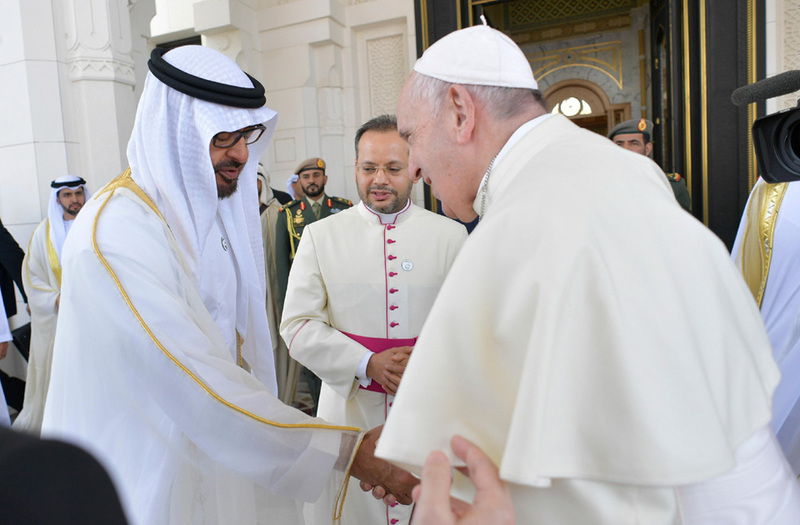 Pope Francis shakes hands with Abu Dhabi's Crown Prince Mohammed bin Zayed Al-Nahyan during a welcome ceremony at the Presidential Palace in Abu Dhabi, United Arab Emirates, February 4, 2019. 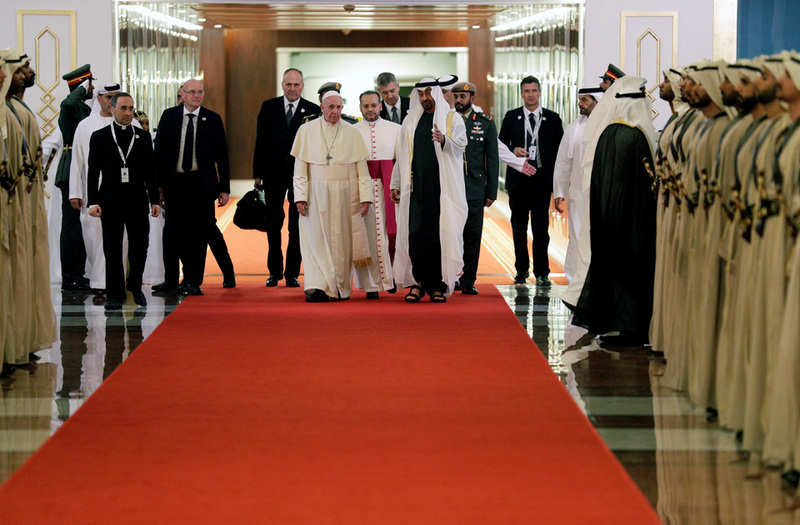 Pope Francis (C-L) is welcomed by Abu Dhabi's Crown Prince Sheikh Mohammed bin Zayed Al-Nahyan (C-R) upon his arrival at Abu Dhabi International Airport in the UAE capital on February 3, 2019.